Great news for all UK customers who want to buy the white version of Motorola RAZR smartphone. Today, Motorola and Phones 4u UK announced the same version of RAZR but in white color. The RAZR White is already available for pre-order both only in online store, from free if you chose the £21.50/month contract. 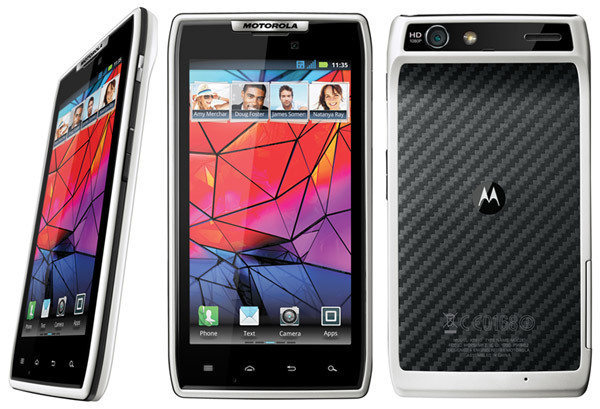 All customers who pre-order or purchase the Motorola RAZR in either black or white before 25th March, 2012, will be entered into a prize draw to win 2 tickets to Snowbombing, the greatest show on snow, taking place in Mayrhofen, Austria (April 9-14). Under the “hood”, the Motorola RAZR smartphones hosts an 1.2GHz dual-core CPU, 1GB of RAM memory and 8 megapixels camera with LED flash and autofocus, capable to record videos at 1080p resolution. Check out this link if you want to see the complete list of RAZR specifications. The white version of RAZR smartphone will be available for 1st March 2012.